There are many laws and guidelines for the operators of watercraft to follow. 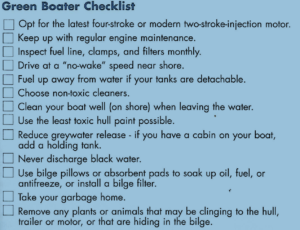 The following list are good practice or etiquette items for proper boating behaviour. Less work for you helps wildlife. If you enjoy seeing wildlife on your waterfront, plan to protect their homes by leaving as much varied, natural plant cover as possible. This provides protection, shelter, and a variety of food sources. The less work you do in changing the original native vegetation on your property, the more wildlife will be attracted to your property! The Lac des Roches watershed has an abundance of waterfowl but the loons are particularly popular. Their distinctive warble that can be heard at any time of the day or night, remind us all that we live in a relatively pristine watershed. We all play a part in protecting the habitat for our waterfowl. 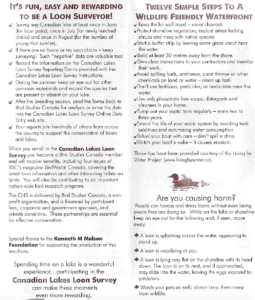 This brochure from Birds Study Canada is particularly useful as a guideline.